Derby's waste - a rubbish blog ! : Dont put it in the recovery position ! It was a simple innocent question that I put to Resource Recovery Solutions at a meeting of the Sinfin waste incineration plants Community Liaison Group (CLG) meeting back in early 2016. We were part way though a presentation by a representative of RRS / SHANKS in relation to what they teach school children they visit at schools across Derby and Derbyshire or tours the construction site with and I was feeling somewhat uneasy that the councils were paying a company that was being employed to burn vast volumes of waste to then also educate school children what we should do with waste. So at that point I thought hey ho lets just pop a question across to the the RRS / SHANKS just to satisfy myself that they were in fact educating school children correctly and that I was being unfair to judge them. It was at this point that a representative of RRS / SHANKS (named in the meetings official minutes) told the meeting that they told children it was a recovery plant. WOW THERE ! WOW THERE ! now hold on just a minute ! did they say it was a RECOVERY PLANT ? really ! a RECOVERY PLANT ? 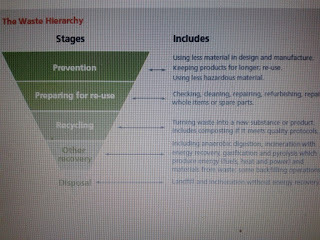 The waste hierarchy just for clarity is a set of processes when dealing with the whole issue of waste that must be considered as it takes in best practices to deal with waste in the most sustainable way. It starts with REDUCTION / PREVENTION where the aim is to reduce what waste we produce so managing materials in the best way - by not using them to start with ! Then we have RE-USE which is where whenever possible we take items that are now scrap and attempt to use them again in an innovative way to keep them out of landfill and incineration. Then comes RECYCLE which is when materials at the end of their life if not reused are reprocessed into new items by making use of the products raw material make up. As we head down the hierarchy we get closer to less sustainable methods of waste management such as incineration and landfill - neither of which are good methods of waste disposal. This brings us to RECOVERY which is when those handling waste start to use wastes for energy generation such as in incineration plants which meet an efficiency target called R1. These are plants which can show that their efficiency of energy generation meets a strict target and often requires such plants to export large volumes of heat or steam to customers to meet that efficiency rating. Finally we come to DISPOSAL which includes inefficient energy generation in incineration plants and also landfill. In a twist to things a plant that meets R1 efficiency targets is STILL a disposal plant until it is granted recovery status. 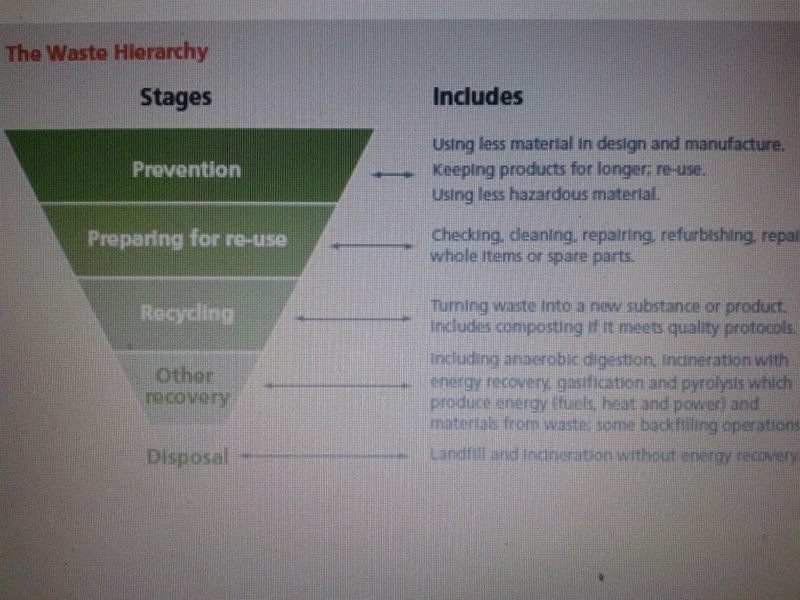 Now rather conveniently for the UK government they use a waste hierarchy image as shown below which I consider to be incorrect as it blurs the lines between recovery and disposal in the waste hierarchy by using questionable wording. Now reviewing the image it would be very easy to be misled into thinking that any incineration plant - including gasification is recovery in the waste hierarchy if it generates energy. The image appears to imply this is the case and as this image is commonly reproduced a gross misunderstanding takes place! It is only when you take the chance to read other areas of the document that the issue of R1 and its application are considered and at that point you realise the difference between recovery and disposal. Obviously there are some who favour this blurring as it allows them to paint a picture of a project that makes it conveniently sound better than it is. To aid you readers below is produced a series of statements from DEFRA from the document in relation to R1 and what is known as D10 disposal. 47. As described above the Waste Framework Directive (WFD) sets out the waste hierarchy and enshrines it in law. It requires that a waste management route defined as recovery should be used ahead of an alternative that is classified as disposal. Exceptions can be made (see below) but this general principle makes it important to know whether a process is considered recovery or disposal. So returning to what the RRS / SHANKS representative said they teach students the plant is. they stated they teach students that the plant is a RECOVERY plant - which raises the issue of R1 as noted above. When we consider R1 and the claims of the RRS / SHANKS representative we know what they are teaching children is false because at the 2nd planning inquiry the developer had to admit that their plant fails the R1 test in its standard mode. If you tell children something that is false then in general it is usually considered a lie. Most important line: "All municipal waste incinerators were and are deemed as disposal activities (D10) unless and until they are shown to meet the requirements of R1."